A decade ago, NASA's Cassini spacecraft, the largest and most complex robotic probe yet built, arrived in the Saturn system to begin a marathon exploration of the gas giant, its famous and awe-inspiring rings and what has turned out to be a collection of some of the most eye-opening moons in the solar system. 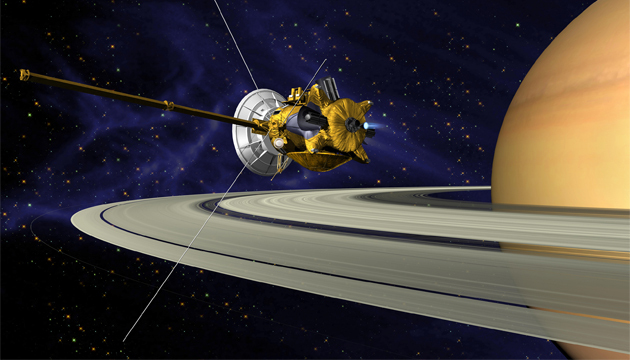 Cassini's status as a permanent orbiting resident of the ringed giant, as well as its deployment of the ESA's Huygens probe to the surface of the giant moon Titan, has afforded us an up-close-and-personal inspection of much of the Saturn system, yielding orders of magnitude more data and details than the three brief flyby missions, Pioneer 11 and Voyagers 1 and 2, that preceded it 25 years earlier. So what has Cassini taught us in its decadal odyssey a billion miles from the sun? The most recent news is that the large moon Titan may be older, in a manner of speaking, than Saturn itself. That is to say, the original building blocks that made Titan may have originated not in the Saturn system, but elsewhere in the primordial nebula from which the solar system formed. NASA and ESA Cassini scientists announced that they had analyzed the chemistry of Titan's largely nitrogen atmosphere and measured a telltale ratio of two forms (isotopes) of that gas, nitrogen-14 and nitrogen-15. The research team finds that this ratio, established by the conditions in which a planet or moon forms, is a stable and largely unchanging value, even over billions of years. Titan's nitrogen isotope ratio suggests that its constituent materials formed in the distant Oort Cloud, the cold realm where many comets originated. The finding also has an implication about the origin of Earth's atmospheric nitrogen, which some had assumed was delivered in the form of ammonia by early comet impacts. But Earth's nitrogen-14/nitrogen-15 ratio is different from Titan's, suggesting a different source than the Oort Cloud comets Titan's nitrogen appears to have come from. Cassini had already revealed Titan as a world in its own right, in many ways a cold analog to Earth, with a thick nitrogen atmosphere, weather systems, and a liquid cycle of methane and ethane complete with cloud formation, precipitation, runoff through river systems and pooling in huge lakes. Titan may also possess a deep ocean of liquid water far beneath its frigid surface, where temperature and pressure conditions are suitable for water to exist in its liquid state. Titan is not the only Saturnian moon to raise scientists' eyebrows. Enceladus was in one specific way even more surprising. Even before Cassini, Titan was known to have a thick atmosphere and clouds, and long suspected of having possible weather systems and liquid on its surface. But Enceladus, a tiny moon only 300 miles in diameter, was not expected to be more than a frigid lump of rock and ice. On the contrary, Enceladus squirts plumes of water and ammonia into space from geyser-like crevasses, indicating the presence of sub-surface liquid water. At first the geysers were hypothesized to erupt from subsurface chambers similar to geysers on Earth, pressurized by tidally generated heat. More recently measurements by Cassini indicate the likely presence of a sizeable ocean of liquid water deep beneath the ice. Possible budget cuts at NASA have cast some doubt on Cassini's longevity going forward, but even if the program were shut down tomorrow the decade Cassini has spent exploring the Saturn system has delivered a wealth of knowledge, not only about Saturn and its moons, but more broadly on the origins of our solar system.